Residenza Pineta Apartments in Molveno ensure a pleasant and relaxing holiday between Molveno lake and the Brenta Dolomites. A holiday in the apartments of Residenza Pineta in Molveno unites the charm of the lake and the magic of the mountains, attractions for kids and lots of comfort for adults, the energizing power of sports and the pleasure of relaxation in a placid and picturesque location. The views of Molveno lake and of the Brenta Dolomites will enchant you from the large windows of every apartment, inviting to venture into this breath-taking scenery in search of new experiences and emotions. 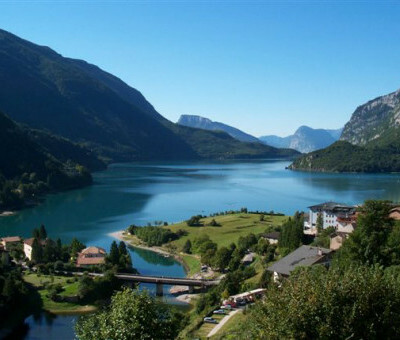 The centre of Molveno is 800 m away and can be reached in just 15 minutes along a path that winds through emerald-green meadows or by free shuttle bus headed for the beach of Molveno. While in winter, just 400 m away from the apartments there is a bus stop for shuttles to the ski area of Andalo. Thus, Pineta Apartments in Molveno prove to be a perfect destination for an immersion into the charming colours of Trentino in summer and into the unique atmosphere of winter holidays in the Dolomites. Molveno, the pearl of Trentino. 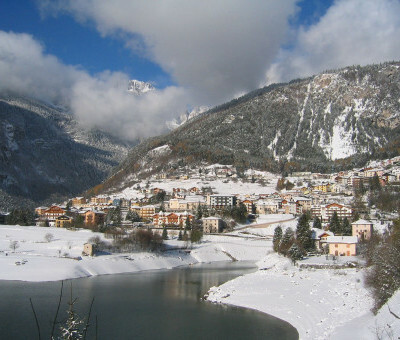 Both in summer and winter Molveno has lots to offer to its guests. A beneficial union of the lake and the mountains ensures you and infinite choice of various sports and entertainments for every taste and age.